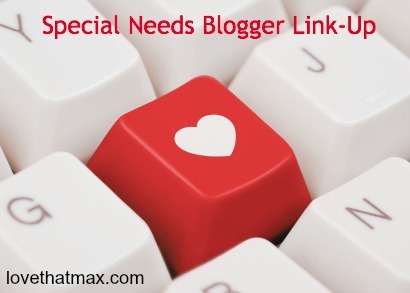 Love That Max : Special Needs Blogger Weekend Link-Up: Bring It! Yes, it's true: It's another weekend link-up for bloggers with kids who have special needs. Like this: Love That Max: I Make My Mom Sing "When You Wish Upon A Star"
Hi, I am new here (to the blog hop, not to Love That Max). Thanks for hosting and have a great weekend! YAY! Happy New Year, y'all! Happy New Year, Ellen! Love you. Thanks Ellenxx love this linkup! Super idea! Learning so much from the posts, thank you! Thanks for hosting this hook-up again. Love sharing/love reading. Happy New Year. Can't wait to do some reading. :) Thanks Ellen. My wish for the New Year is that our society makes it a little easier for parents to accept their child's special needs by removing the stigma from having a diagnosis. Happy New Year - and welcome back, Ellen! My post is a real letter to someone who emailed me. She had her first baby three months ago and is in that black hole that many of us were in during those early days. I could have written this letter to myself and sent it back in time five years. It's called "Dear You,"
xoxo and thanks, as always, for being so supportive of others on your own blog!! Thanks for bringing us together, Ellen. Hope it's the beginning of a year full of abundant blessings for all! I loved your Disney stories, especially the one about Max at dinner. Thank you for bringing us all together! Thank you for helping us have a voice for being a Special needs mama. Thank you and God bless you! Thank you for bringing all of us SN Mumma's together. Happy 2013!